I’d been contemplating picking up something from Zelph for quite a while and when Dan offered a 2-for-1 Valentine’s Day special on the Super Stove I decided it was high time to make a purchase. The package arrived yesterday and I was surprised when I opened it. The Super Stove certainly wins the prize for the “cool” factor. 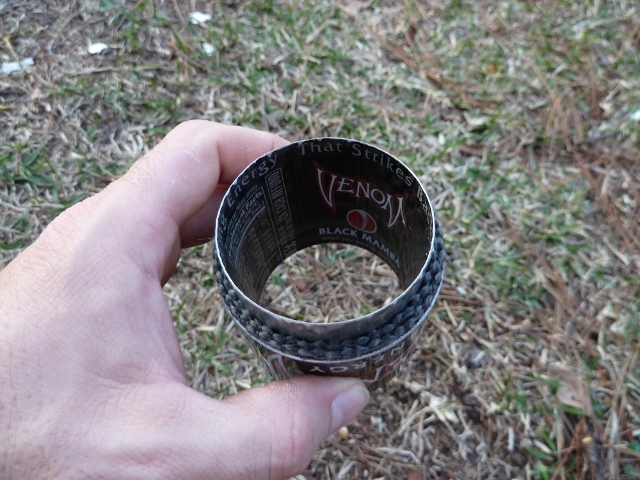 The Super Stove is made from a Venom energy drink aluminum bottle. I wasn’t expecting the design to be what it was. Rather than having the top of the bottle inverted into the bottom you end up with a tube. 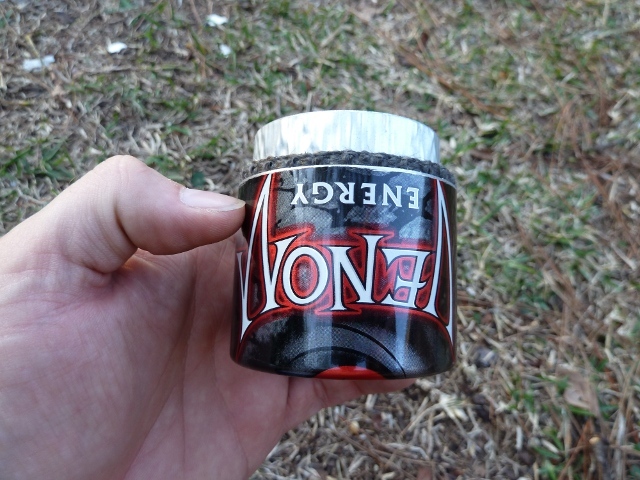 There is a fiberglass wick sandwiched between the sections and this is where you add your fuel. 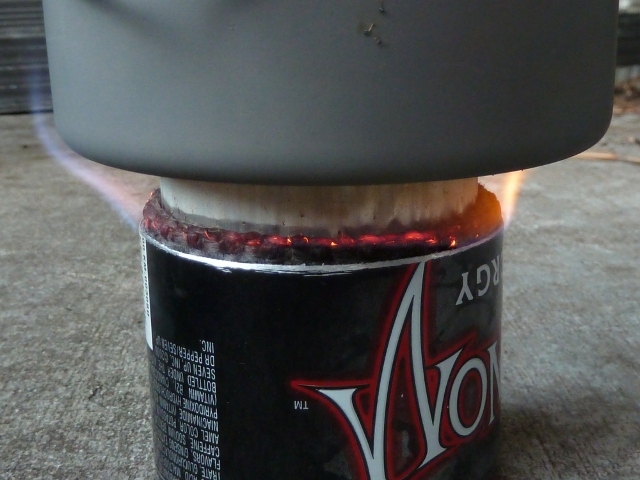 The stove weighed in at 1.7 oz and has a 1 oz fuel capacity. I wish that I could say that it met the “optimal conditions” spec of boiling 2 cups of water on 1/2 oz of fuel but I have yet to accomplish that. Testing with both a 700ml titanium pot and 900ml aluminum pot ended with the same results. After flaming out at just under 8 minutes (7:53 with the titanium) I had very hot water but no boil. Even though I didn’t get a boil on 1/2 oz I’m not really disappointed. It may be that I need just a little more fuel and can get a boil on 3/4. I will say that it’s not the fastest stove but I can easily see carrying it with me. I seldom actually wait for a boil anyway so the water I ended up with would be sufficient for what I do 9 times out of 10. Overall I’m happy with the stove and think it’s a nice one to have in the collection. I do think that the fiberglass wick will probably make it more reliable in windy conditions as well. I was finally able to get a good, rolling boil on 1/2 oz of fuel as Zelph states. In an odd twist it took just 6:30 or so which is about a minute and a half before I flamed out in previous tests. Based on that I should’ve (in theory) achieved a boil each time. I might try 3/4 oz and see if that yields more consistent results in varying conditions. Google came up with your comments on the Super Stove. I used a 5.5″ aluminum 2.5 cup capacity to get the boil with 2 cups water using the 1/2 ounce fuel. Thanks for the review.